Desktop File provides a versatile way to store your letter-size project files on your desk or on-the-go. Side handles and durable plastic construction offer easy portability so pet projects are never far from reach. 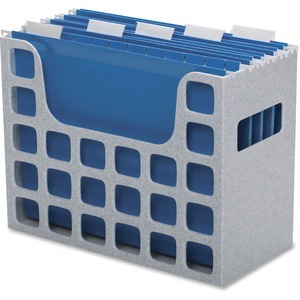 This sturdy hanging-file box with a 6" capacity is sized to fit nicely on your desktop or in other small spaces. To start organizing immediately, the desktop file includes five letter-sizes hanging folders with clear tabs and inserts to put you on the path to organization.